I am torn at the moment between two amazing foundations, Nars Sheer Glow in Mont Blanc and YSL Forever Youth Liberator in B20. Both give me an amazing glowing complexion without a hint of shine or a caked on look. I'm going to be so sad when these run out! Another amazing product from Nars, the Radient Creamy Concealer in Vanilla stands at the top of my concealer favourites. I usually dab this under my eyes (you don't need a lot - a little definitely goes a long way with this) and blend it in and voila, goodbye tired eyes! My second fave goes is YSL's Touche Eclat, every woman should own this in my opinion, it's one of those cult products that's achieved such a status for a reason. Again, this is lovely for a lighter coverage under my eyes. When the Hourglass Ambient Lighting Powders were release last year I lusted after one for absolutely ages but couldn't decide which powder to buy, did I want a highlighter or a colour for all over? I decided to go for Dim Light for an all over colour and I'm so glad I did. This is such a silky smooth powder, it doesn't cake or look too fake on my skin. It's perfect! I don't actually wear bronzer so I physically do not own any. I know it may sound odd but I'm a little afraid of bronzer because I'm so pale, if someone wants to teach me how to use it properly without turning orange, and lets me know of a really good bronzer then I'd be greatful! My most used highlighter has to be Benefit's Watt's Up but I recently finished mine and so it's being saved for my empties post. My second fave is Nars Albatross, another of those highly coveted Nars products. This is a lovely pale white / silver highlighter with teeny flecks of glitter that really adds a glow to the face. Highlighter has to be my all time favourite makeup product, I feel naked without it on. I can't think of a single eyeshadow I love to use all the time so my most recent palette addition to my collection is Urban Decay's Naked 3 Palette which I adore. I thought I wouldn't get much use out of the pinky shades when I first swatched this in store but ended up falling in love. There are enough UD Naked 3 reviews out there in the blogosphere for me to harp on about this palette, so all I'll say is go and swatch it if you haven't already. After highlighter mascara is definitely another of my most favourite makeup products. I'm such a mascara fiend that it was hard to pick just one and I ultimately decided to go with YSL's Babydoll mascara. It's no secret that I prefer mascara wands with plastic rather than fibre type bristles and this is just perfect for giving my lovely lashes without clumps. Another makeup item I just don't wear. I've never even tried lipliner, and I don't think I plan to either. I found it hard to pick a single lipstick for this part of the tag because I love my MAC and YSL lippies all the same. 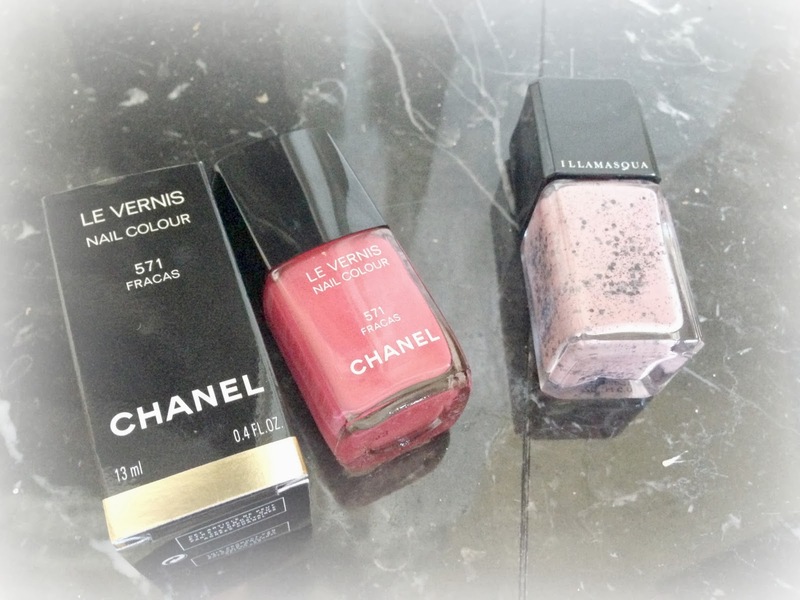 So I decided to pop in my Chanel Glossimer Lipglosses here instead. I am obsessed with these, they are just so perfect, not drying on the lips, not too wet and sticky either, in shades of wearable colours - what more could you want? I am in love and had definitely got plans to add to my collection. A recent addition to my candle collection is Diptyque's Baies miniature candle. I have an abundance of Yankee Candle wax tarts and votives, but had never really splashed out on a 'grown up' candle before. I'm so glad I did for this little beaut, it smells divine in my room and I haven't even burned it yet! Due to the fact that I work in a restaurant I'm not allowed to have my nails painted, so I don't own that much nail polish in comparison to some amazing collections I've seen, but I do own two beauts that I adore, Illamasqua's Speckle nail polish (perfect for Easter time!) and Chanel's Fracas. I'd love to get my hands on Chanel Taboo at some point too. That's my Princess Tag, what's yours? Any of these products take your fancy or are ones that you use already? Fab selection of products! Looks like a collection to die for! I'm so glad you've said that about the bronzer, I literally said today to my mum that I've never tried blusher because I've got darker skin so I stick to bronzer, and blush suits pale skin! My sister constantly calls me a makeup snob but I like both my high end and highstreet in equal measures and I always know what I want aswell! I love your Chanel Glossimer collection, this is one Chanel product I have never bought but have had applied a fair few times! I really want to try out the ysl foundation as well!